Happy Wednesday everyone and that can only mean one thing....time to go for a snoop around everyone's desks! I didn't have much on mine today so I thought I'd take a piccie of a corner of my cabin. Looking at this, I realise that I have a terrible paper habit! I just can't stop buying it and then don't want to use it as it's too nice. I really must "have a word with myself!" If that was all the paper it wouldn't be as bad but I've also got a tall paper rack on another wall and my cardstock is stored on another wall! Repeat after me..."you're a bad person and it's only paper so just use it!!!" 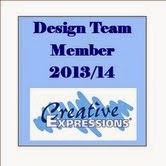 As it's Wednesday, it's also my day on the Creative Studios Design Team blog. Here's what I've come up with for this week. It's also a project that I'll be teaching at a workshop in September at Martells in Cliftonville. I've used the "Art Houses, Art Flower and Wise Friends" sets of stamps from Creative Studios. There's step by step instructions on the blog and the link is Sam Poole Designs on the right of this page. So, now in to today's travel photo. This is St David's Cathedral in Wales. St David's is the smallest city in the UK. It's also true that it rains a lot in Wales but the grass is always lush and green! That's about it for today. Many thanks for visiting and thank you to those who have signed up as followers. We're creeping towards the 300 mark and then I'll draw the blog candy winner. Also thanks for all the wonderful comments. I'll try to visit as many of you as I can. I seem to always get to about 90 before real life comes along and drags me kicking and screaming back into the real world! So Until next time, have a happy, crafty (and possibly sunny) week! Look like that paper my topple anytime. Hope the bookends are heavy! Happy WOYWW and I wish you a wonderful week. LOL! Your shelves must groan like mine! I could scrap/stamp/create for YEARS even if I never bought another sheet of paper. What are we like? I have the exact same problem with paper. Far too much of it and it's too good to use! Oh dear! We used to sing the kookaburra song too. It was always done as a round. Lovely Cathedral - not seen that one but I love the Marble Church at Bodelwyddan (sp?). If ever you go Pam check out the pulpit, it is lovely. Back to your desk Pam - I am getting away from the paper fetish and developing a fabric one to just make even less space in my room. Still not using the paper but not buying as much. What are we crafters like? Lots of lovely things to see here :o) Thank you for the kind comment on my pinwheel card. You know how I beat my paper habit (except with washi, as it is so unique struggle with it) other paper I find scanning and printing in high resolution on good paper! it works a treat for favourite designer paper then easy to break into a sheet ..
..as you can make some more - if need be file it under digi paper in my craft files. I think we all have our little collections Pam, I have a rather large collection of ribbon, Christmas stamps in in general and House Mouse stamps too! Thanks for the card love and you're really, really welcome to a bit of our heat right now! WIll you take some humidity too? PS, I signed up as a follower. Oh a fellow paper addict. I am better than I was and do use some of it but I definitely have just looking paper pads too. I'd love to come and rummage through those shelves of yours. Hi, my name is Rachel and I'm a paper addict. Although your stash makes me want to rummage and play. Why not frame some of your favourites? I don't think you are a bad person...it happens. But I will tell you that once you start using all those bits and bobs you are in love with they TOTALLY enhance whatever you are doing. Not only does the final piece have its own mojo, but because you used something you love, your appreciate is heightened. I was making a journal last year and included some things I though were just oh so cool, and I LOVED it. I'm hooked now. Of course my stash needs to be replenished more often but I don't really see that as a problem. Hi Pam, Thanks for dropping by and also thanks for the comments on the canvas. I will definitely post a picture of this piece finished. Every single person who has visited me today has left a comment about it. Very surprised indeed so it's nice to get such feedback! Apologies for the lateness of my visit, been out most of the day with my mum. Love the photo of that cathedral! What a magnificent building! Ha, I had to give up the paper habit so I could keep up the fabric habit! What a beautiful cathedral. I would so love to visit Wales. Paper, ribbon, lace, fabric, broken jewellery, bits and bobs. We all have those habits. I have papers I have kept for years. oh happy days just look at all that paper. I have the same problem as you I am addicted to paper and card and can't get enough of it but then can't use it as it is too nice. Pam, don't worry about the paper, we all do that, I have had some paper that is just too pretty to use for years. I have recently managed to sort all my paper into colours so it is more likely to get used.A friend of mine, Pyro jack, just on woyww for the first time this week, told my hubby one day that craft materials are very cheap to keep. They don't eat anything, they don't cost anything to store, they don't have use by labels like food, they don't rot, in fact hubby was to leave me alone to get craft materials with my money and not to nag. I made a NY's resolution to use it or lose it this year, so no more attachments for me! Ha- I'll call you w hen I get there. thanks for visiting and welcoming me to yourplace. Hi Pam, why is it we find it so hard to use our papers. Even getting one to use and one to stroke doesn't alway work. I've been crafting since about 1994/5 so have a fair bit too. You can never have too much paper. I have actually used some today. I know what you mean about having a secret affair with paper, I cant seem to stop buying it either. Very very late happy WOYWW, as the next one is tomorrow! I love any crafty stash and buy too much of it! Did anyone win your blog candy, I can't find who did?